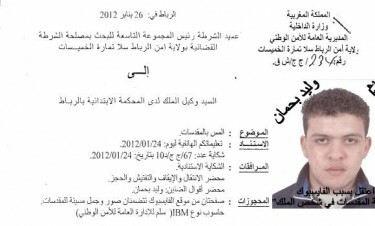 On February 7, 2012, Walid Bahomane appeared before a court in the Moroccan capital Rabat. The 18-year-old is accused of “defaming Morocco's sacred values” by posting pictures and videos on Facebook mocking king Mohammed VI of Morocco. This isn't the first time a Moroccan internet user faces such charges. In 2008 Fouad Mourtada, a young engineer, was sentenced to three years in prison for impersonating the king’s brother on Facebook. An international outcry and a campaign of support forced the authorities to release Mr Mourtada a month after his arrest. Walid Bahomane's arrest is the first since a constitutional reform last summer (theoretically) revoked the “sacred” character of the monarch. The king is still, however, the focus of a great deal of devotion in the country. Copy of the police report filed against Mr. Walid Bahomane as posted on Facebook. Despite calls for his release the judge decided to send Walid to a juvenile detention facility near the capital pending his trial. A group of netizens have reacted to the arrest of Mr Bahomane by creating a support group on Facebook called “Mohammed VI, my freedom is more sacred than you!“, where members are invited to publish and share cartoons of the king. This is a solidarity group with the young Walid Bahoman, aged 18, detained in the juvenile detention facility of Salé for insulting His Majesty Mohammed VI on Facebook. Let us prove to Mohammed VI that our freedom is more sacred than him. This arrest flies in the face of the propaganda put out by the Moroccan state around the idea of change and the alleged democratic advances. @MusiqueArabe Operation support Walid Bahomane – publish a (king's) cartoon of you choice on your profile. Despite the recent constitutional reforms in Morocco the regime does not seem prepared to tolerate any violation of its red lines. 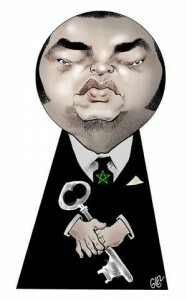 In July 2011, a few days after the adoption of the new constitution, a French newspaper, Le Courrier International, was censored [fr] in Morocco because it contained an irreverent caricature of the king. The independent press has often suffered the wrath of the regime when it dared tackle the sensitive subject of the monarchy. So much so that the Internet seems today the last frontier where most Moroccans can still exercise their right to free expression. Something Moroccan netizens seem to be fully aware of. Inspired by the Arab spring, they seem determined to close ranks and show solidarity with Mr Bahomane. As a result, exercising censorship will be even more difficult for the regime.